Arrange a rack in the middle of the oven and heat to 425°F. Place the cornmeal, flour, sugar, baking powder, salt, and baking soda in a medium bowl and whisk to combine. Whisk the egg, sour cream, and butter together in a small bowl. Add the sour cream mixture to the cornmeal mixture and stir to combine. Fold in the cheese (the batter will be thick); set aside. Heat the oil in a 10-inch oven-safe skillet (such as cast iron) over medium heat until shimmering. Add the onion, chili powder, and salt and cook until onion is softened, 5 to 6 minutes. Add the garlic and cook until fragrant, about 30 seconds. Increase the heat to medium-high. Add the ground beef and cook, breaking up with a spoon, until no longer pink, 5 to 6 minutes. Add the beans, corn, and tomatoes and stir to combine. Simmer until slightly thickened, about 5 minutes. Remove from the heat and stir in the cheese. Dollop small spoonfuls of cornbread batter over the filling. Use the back of a knife or an offset spatula to spread into an even layer. Place the skillet on a rimmed baking sheet. Bake until the filling is bubbling and the cornbread is golden-brown, 15 to 20 minutes. Let cool 10 minutes before serving with cilantro or pickled jalapeños if desired, and a dollop of sour cream. Storage: Leftovers can be refrigerated in an airtight container for up to 4 days. This entry was posted in Recipes and tagged hamburger, pie on December 30, 2018 by The Yellow Pine Times. Preheat oven to 350 degrees Fahrenheit and grease a 9-by-13 casserole dish. Preheat olive oil in a large skillet over medium heat. Add ground beef and cook, stirring regularly, for about 10 minutes. Drain and place in a large bowl. While the beef is cooking, melt butter in a medium saucepan over medium heat. Whisk in flour until there are no lumps. Allow the flour to cook out for about 2 or 3 minutes. Whisk in onion powder and garlic powder. Slowly whisk in the milk, breaking up lumps. Season milk mixture with 1 teaspoon of salt and 1/2 ground black pepper. Whisk and continue cooking over medium heat for about 10 minutes, until it thickens slightly. Add the tater tots, crumbled bacon, cheddar cheese, sour cream and béchamel mixture to the bowl with the ground beef. Stir to mix all ingredients. Pour the mixture into the baking dish and spread evenly. Bake for 45 to 50 minutes, until the entire mixture is bubbly and the cheese has fully melted. This entry was posted in Recipes and tagged bacon, casserole, hamburger on December 23, 2018 by The Yellow Pine Times. Pour half of the tomato sauce into a 6-quart slow cooker. Pour half of the diced tomatoes into the slow cooker as well. Add entire box of frozen meatballs. Top meatballs with remaining half of tomato sauce then diced tomatoes. Place lid on slow cooker and cook on low for 6 hours or on high for 3 hours, until meatballs and sauce are both hot. Remove lid and sprinkle mozzarella cheese over the top of the meatballs. Replace lid and continue cooking on low for half an hour, until cheese is melted. 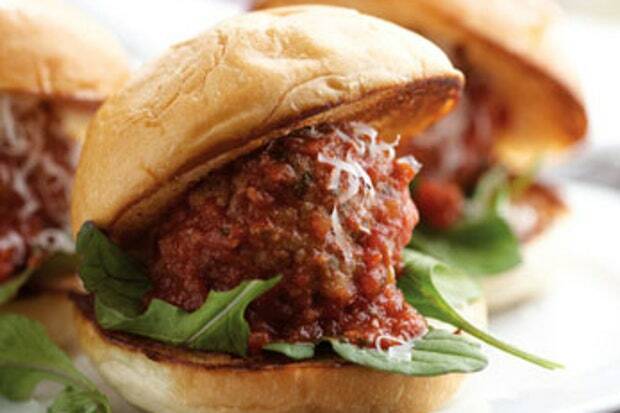 Place two or three meatballs with some melted cheese on one slider bun. Top with one or two basil leaves. Repeat with remaining slider buns. This entry was posted in Recipes and tagged hamburger on October 21, 2018 by The Yellow Pine Times. Heat 2 tablespoons of olive oil in a large pot over high heat. Add the onion and garlic. Cook until starting to brown, stirring occasionally, 3-4 minutes. Add the beef, salt, and pepper. Cook until all of the moisture has evaporated and the meat is starting to brown on the edges, breaking the meat up as you stir, 10-12 minutes. Add the tomato sauce and tomato paste, then reduce the heat to medium and bring the sauce to a simmer. Cook it down until the mixture becomes thick, about 15 minutes. Remove the pot from the heat and set aside. In a small bowl, combine the ricotta, basil, egg, and Parmesan. Stir until smooth. Set aside. Grease a large oven-safe metal bowl with the remaining tablespoon of olive oil, then lay about 25 lasagna noodles along the sides and bottom of the bowl, fanning them out in an overlapping pattern. The ends of the noodles should hang over the sides of the bowl. 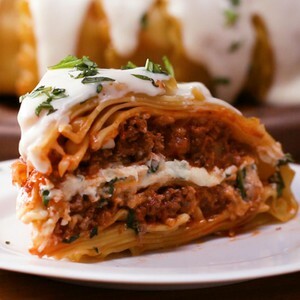 Slice the remaining lasagna noodles in half crosswise. These will serve as the layers between the meat and the cheese mixtures. Sprinkle half of the mozzarella into the bottom of the bowl on top of the noodles. This will help bind the noodles together when cooked. Spread half of the meat mixture evenly over the mozzarella, then lay half of the cut noodles over the sauce. Spread all of the ricotta mixture over the noodles, then layer with the rest of the noodles, then the rest of the mozzarella, and the rest of the meat sauce. Fold the edges of the lasagna noodles hanging over the sides of the bowl back towards the center, creating another overlapping pattern. Cover with foil and bake for about 45 minutes, until cooked through. Meanwhile, make the béchamel: In a saucepan over medium heat, melt the butter. Add the flour and cook, whisking continuously, for about 2 minutes until a paste forms. Add the hot milk and continue to whisk as the sauce thickens and comes to a boil. Season with salt and pepper and add the Parmesan. Reduce the heat to low, and cook, still whisking, for 2-3 minutes more. Invert the lasagna dome onto a cutting board. Pour the béchamel sauce over the dome and top with basil. Slice the dome, then top with more Parmesan and basil, if desired. 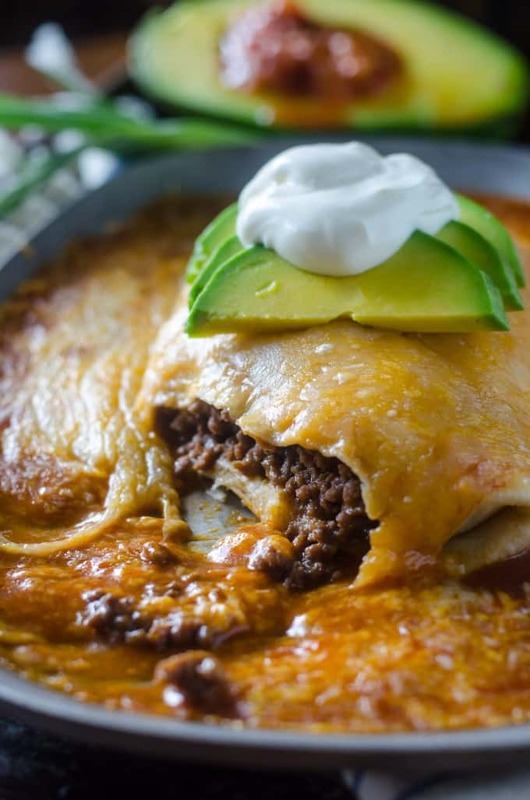 This entry was posted in Recipes and tagged hamburger, lasagna on September 30, 2018 by The Yellow Pine Times. Preheat oven to 350F and lightly grease a 9×13-inch baking dish with butter or non-stick spray. Heat olive oil in a large pan or skillet over medium-high heat and sauté potatoes until tender. 10-15 minutes. Transfer potatoes to a separate bowl and set aside. Add ground beef and onions to the skillet and cook until beef is browned and onions are tender. Season with garlic powder, parsley, salt and pepper. Drain fat from pan and transfer beef and onions to the same bowl as potatoes. Place beef, onions and potatoes into greased baking dish. In a separate bowl, whisk together milk and eggs, and stir in cheddar cheese. Pour mixture over beef and vegetables and stir everything together. Place baking dish in oven and bake for 20 minutes, or until eggs are cooked and everything is warmed through. This entry was posted in Recipes and tagged breakfast, casserole, eggs, hamburger on September 16, 2018 by The Yellow Pine Times. 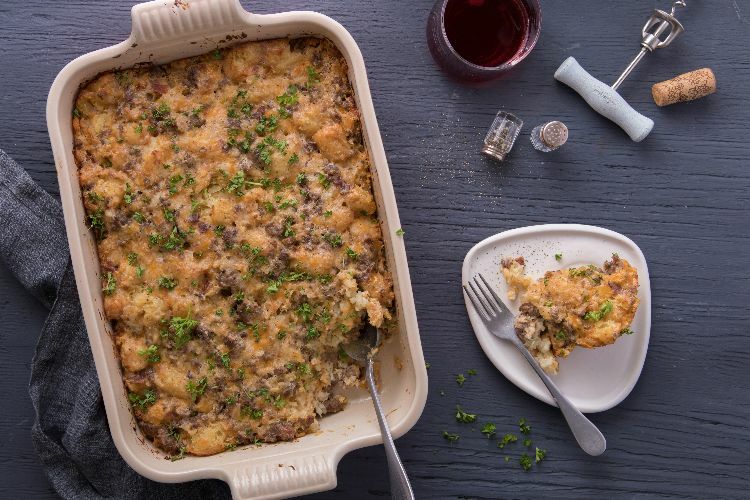 In a large skillet over medium heat, add the ground beef and brown. Drain fat. Stir the taco seasoning into the meat, along with the bouillon cube. Pour in the beer and beef stock, stir to combine. Bring to a simmer and cook until the liquid is almost gone. Be mindful towards the end to stir so you don’t scorch the pan. To make the sauce: in a small saucepan, melt the butter over medium heat. Whisk in the flour and cook for 1 minute. Slowly whisk in the stock, then the enchilada sauce, bouillon cube and chili powder. Simmer until thickened. Spoon 1/4 of the beef into the center of a tortilla. Wrap the burrito up and place on an oven-safe plate. Pour sauce over the top and top with 3/4 cup shredded cheese. Bake in preheated oven for 10-12 minutes. Serve immediately. This entry was posted in Recipes and tagged hamburger on August 26, 2018 by The Yellow Pine Times. Heat oil in a large skillet over medium high heat. Add onion and garlic, cook for 1 minute. Then add carrots and celery. Cook for 5 minutes or until softened and sweet. Turn heat up to high. Add beef and cook, breaking it up as you go, until browned. Add flour and mix in, then add tomato paste and mix in. Add beef stock, red wine, beef bouillon cube, Worcestershire sauce, thyme and bay leaves. Bring to simmer, then turn down heat so it is simmering rapidly – I have it on medium high. Cook for 20 – 30 minutes, stirring occasionally, until it reduces down to a gravy consistency (Note 1) (see video). Cook potatoes in boiling water for 15 minutes or until soft. Drain then return to pot on turned off stove. Shake briefly and allow to steam dry for 30 seconds or so (Note 3). Add butter and mash until melted, then add milk and salt (+ optional nutmeg). Mash until smooth. Spread onto pie, use a fork to rough up the surface (rougher surface = more golden bits), drizzle with olive oil. Bake for 25 – 30 minutes or until golden on top and bubbling on the edges. Stick a knife into the middle to ensure it is piping hot. Stand for 5 minutes before serving, garnished with fresh thyme leaves if desired. * Carrots and celery are used to make a truly great mirepoix / soffrritto flavour base for this pie. However, they can be omitted, but add 1 tsp of sugar instead. 1. 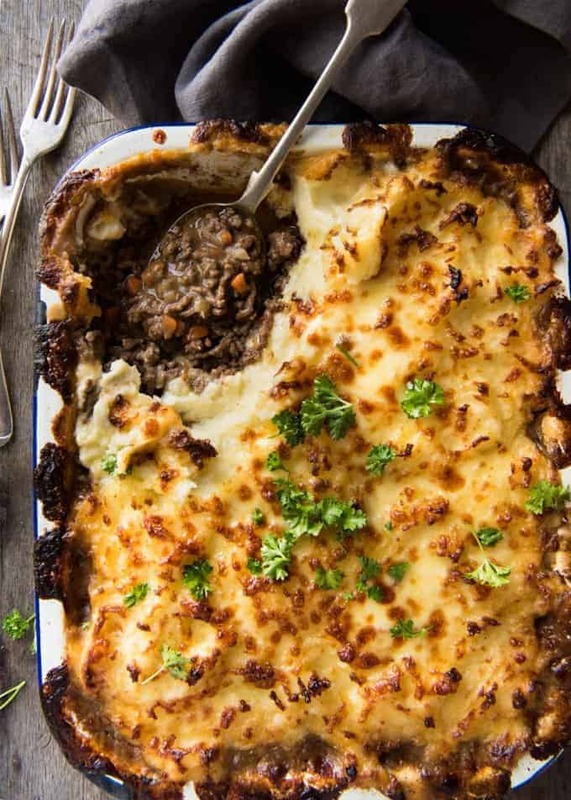 Whatever the thickness of the sauce when you pour it into the tin, that’s what it will be once baked – no steam escapes while baking to allow it to reduce any further. So keep cooking until it’s the consistency you want. 2. Cooling the filling ensures that the potato doesn’t sink into the filling. If you are in a rush – as I often am – pop it in the freezer while you make the potato. That works pretty well. 3. Watery potatoes drops excess liquid while baking into the filling which makes the sauce watery. So don’t skip the step of steam drying the potatoes. Also, make sure the mash is hot when spreading onto the pie. Cold mash is hard and so it is harder to dollop / spread onto the pie. 4. 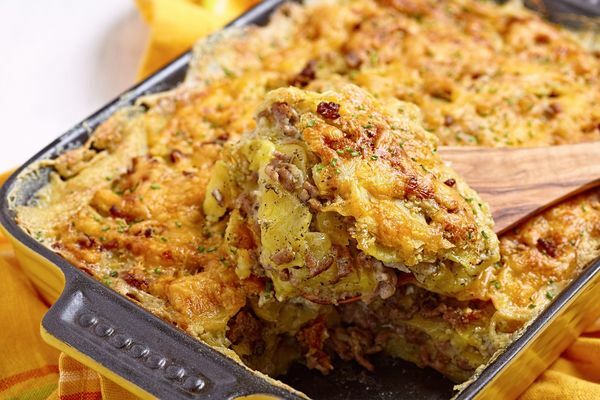 Variations: If I’m making this for company or am on a calorie-blow-out mission, I add a big handful of cheese into the potato and also top with more cheese before baking. It doesn’t need it, it’s a bonus. For the filling, sometimes I add peas, or I reduce the amount of beef and add chopped veggies like zucchini. 5. Make ahead instructions: Assemble pie but don’t bake it. Cool mashed potato topping then either refrigerate or freeze. Thaw if frozen (it will take way too long to bake from frozen) then bake as per recipe. This entry was posted in Recipes and tagged hamburger, pie on August 12, 2018 by The Yellow Pine Times.